Dear friends of Asean and friends from different countries in this forum. I really appreciate giving this opportunity to speak about peace and Democracy.Thank you so much all organizers of this Asean people forum. These two sentences were repeated throughout the peace walks of the Saffron Revolution, two years ago. Monks led the people in 65 cities, calling for the basic needs of the people, peace and reconciliation. Monks wish peace not only for Burma but for the whole world. But unfortunately the regime cracked down brutally on these peace wishers,the monks and nuns; what does it mean that these destroyers of peace are members of ASEAN? is this acceptable? But in Burma there is no peace and justice so we must speak out very openly. No democracy means no freedom, no justice and no peace. ASEAN is judged by the people of ASEAN and our international friends by how it deals with Burma. Burma is the measure of ASEAN’s success or failure. Today I speak to you not just with my voice, but I speak for the voice of the people, especially those friends of mine who are in jail. Monks like myself who have spoken for peace for democracy are now in prison. For many people in Burma life is like a prison. All are living in fear. Even those working for the military live in fear. Instead of being able to live peacefully with families and neighbors they are forced to build pipelines so that the junta can put oil money in their own pockets. Children, instead of being able to go to school are forced to be soldiers. And instead of living in their own country they are forced to work in neighboring countries without human dignity, just so their families can survive. These workers – even after 20 years of waiting – cannot yet go back home because in Burma there is no peace yet. Imagine how homesick they feel. I cannot stay silent about ASEAN when it is not doing good enough. The whole region suffers from human trafficking, drug production and out-migration from Burma. These are caused by the economic mismanagement of the regime. Business is controlled by the regime; people produce drugs – or move elsewhere – simply to survive, to eat, to have food. And these drugs travel across the whole world – as a Buddhist monk, it concerns me deeply that my country produces drugs that makes families – and indeed, the whole world – suffer. Democracy is the only way to make change. ASEAN talks about human trafficking, drug production and migration, but it doesn’t talk about political change, the root of all our problems. We need political solutions, with ASEAN support, to address this regional insecurity. ASEAN must take responsibility. A main goal of genuine democracy is to deliver hope to people that they can have choices; people can have hope, and people can have voice in their communities. We want real democracy, not a sham democracy. Democracy is the way that we can live peacefully together. Only democratic leaders speak with the same voice as the people. The regime’s voice is not our voice. I want democracy for my people. And all the people of ASEAN. Indeed, we want it for ASEAN itself; so that the voice of ASEAN is the voice of the people. We haven’t had a government in Burma – they do not take care of the people – we did not elect them – people do not want them and have been suffering enough. The people of Burma are like children who have no parents, people who have no government to take care of them. They neglect the people’s needs. Monks and people rely on each other – we are connected – we monks see the suffering of the people. That is why we stand on the side of oppressed people or justice side. For 47 years Burma has been ruled by a dictatorship. It has caused many problems affecting not only Burma’s people but the entire region and indeed around the world. ASEAN leaders, because you did not speak out for political change, the regime has hung onto power so long. Now the military regime is seeking nuclear enrichment to stay in power. 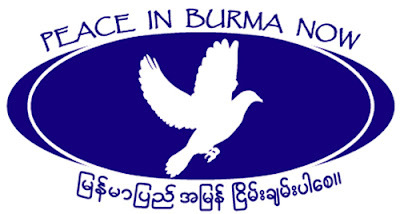 Even if the ASEAN leaders do not speak out against nuclear technology development in Burma, we the people of the world and ASEAN – we here – must speak out against nuclear weapon programs in Burma. We must speak out for peace. 3) freedom of peaceful assembly and association. Why are these freedoms still not guaranteed in ASEAN? How can democracy in ASEAN flourish without them? One reason Burma is not free is because ASEAN is not yet free. The people of ASEAN want a free Burma. If ASEAN leaders listened to the people then Burma would be a more free state. We are in this together. I give praise to those countries moving ahead – like Indonesia, the Philippines and Thailand – who act for people of Burma. ASEAN needs to support the long life of people, instead of the long life of the junta. The regime is so happy to be member of ASEAN, but the people of Burma are very sad because Asean leaders support the dictatorship. As human beings we have responsibility to take care of each other. That includes leaders.Human Rights violation widely spread out in Burma and half million Internal Displaced People(IDP) are living in the forest of Burma because of the civil war.In this case ASEAN’s non – interference policy is wrong…. . If parents next door are killing their own children – and you see and hear it, but you don’t say “stop”, you are neglecting your responsibility as a neighbor. The Burma regime is killing its people; it’s ASEAN’s responsibility to say “stop”. This is not an internal affair. It is a human affair. All human beings must speak out to say “stop killing”; it is the responsibility of all of us. Look at European countries; no one argues there for non-interference, because all those countries are free. I feel very sad seeing the check points between Mae Sot and Bangkok. In the 21st century, the checkpoints and borders are still closed. We must open up the borders, instead of closing the gates. We need to break down borders, to come together, to live peacefully together. What can ASEAN do? It cannot continue its policy of economic engagement without being responsible for a parallel political engagement. An engagement for peace and reconciliation. All people who have sympathy and compassion for Burma can work together,If all Asean people have same spirit then we can live happily and peacefully together. We can walk same direction together. Dear friends of Asean and friends around the world let us live happily together. Let us walk on peacefully together. Thank you very much Thailand hosting this forum and strengthening peace and democracy for Burma.